From the moment we arrived in Jordan, spending the night at a Bedouin Wadi Rum camp was near the top of our list of things to do in Jordan. 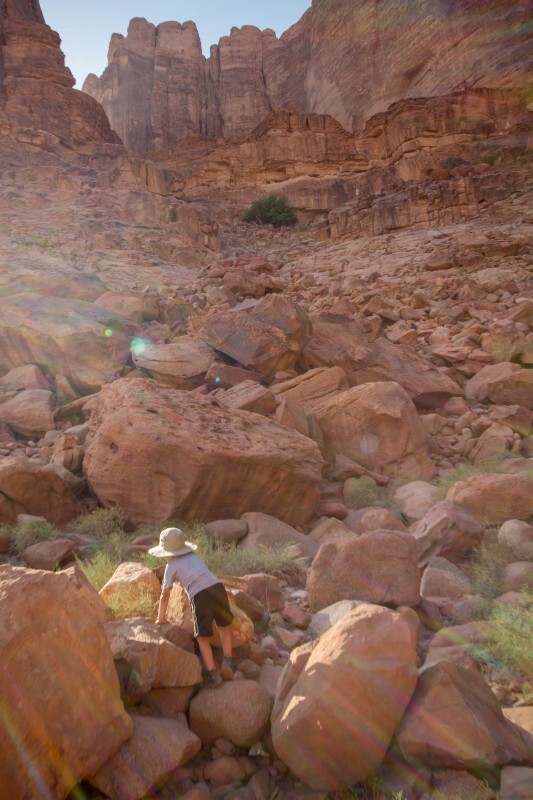 After spending two and a half days exploring the ruins of Petra with kids we couldn’t wait to spend a night lying under the canopy of stars in the midst of the famed Wadi Rum desert. Our minds were still reeling from all of the incredible sites and experiences we had during our time there. But we were anxious for more amazing Jordan travel experiences. Wadi Rum desert camps have become a tourism staple in this young country. Bedouin-style camping in the desert, what was once a remote, off-the-beaten-track type of experience, has exploded in popularity. 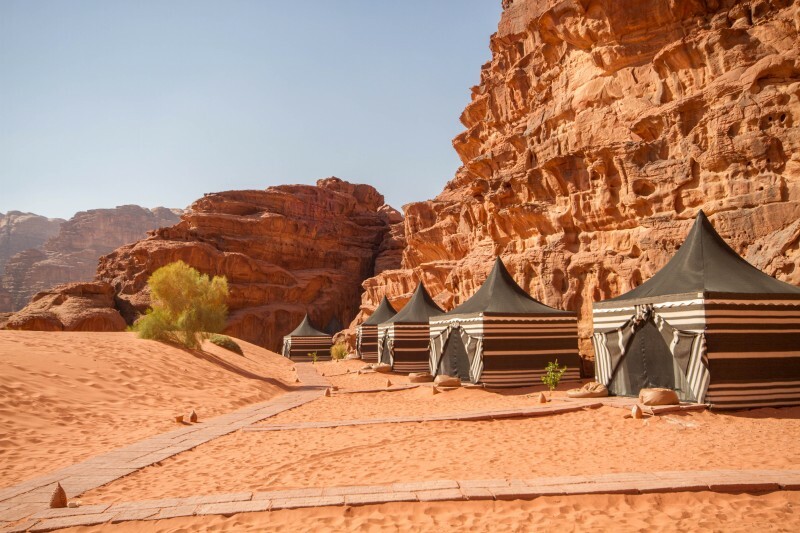 A number of Wadi Rum Bedouin camp experiences have popped up throughout the desert ranging from modest, authentic tented camping to full-on luxury glamping in Wadi Rum. But it’s not just the Bedouin camping experiences that have made Wadi Rum such a popular destination for travel in Jordan. 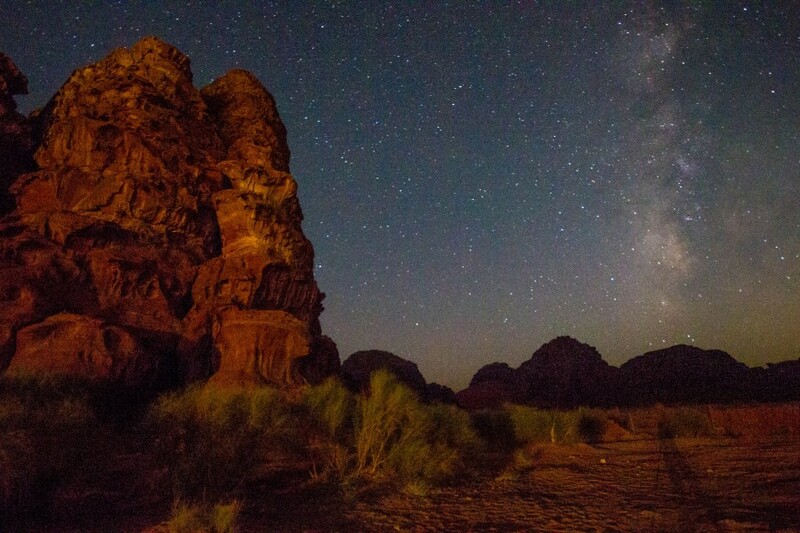 The Wadi Rum desert is one of the most beautiful places in the country. And as soon as people arrive, they seem to instantly forget about the rest of the world. Our large white van hummed along the well-maintained highways towards the famous Valley of the Moon, the desert valley of Wadi Rum. Wadi Rum is often touted as one of the most beautiful deserts in the world. A Wadi is an Arabic term for “Valley”. It usually refers to a valley that only contains water during periods of heavy rain. 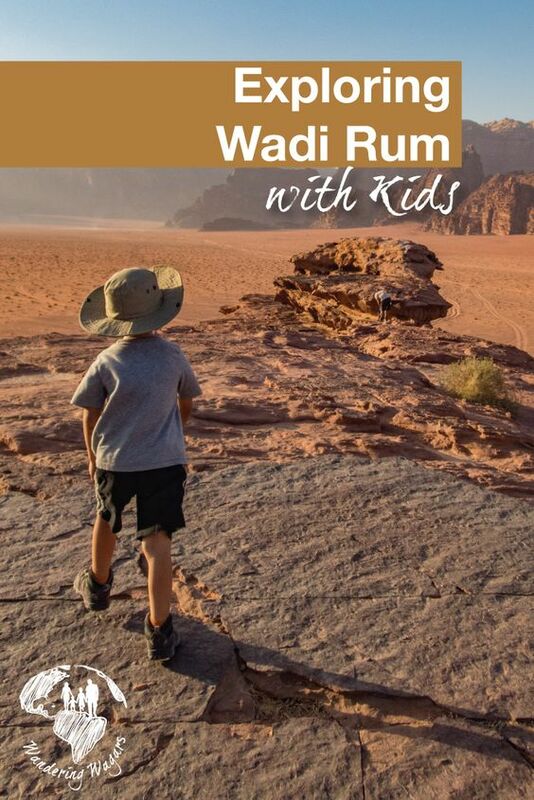 And Wadi Rum stands for Valley of the Romans. It’s actually the largest Wadi in Jordan, covering an area of 720 sq. km. (278 sq. miles). The landscape of Wadi Rum is classic in its desert climate. Extreme temperatures are the norm here with both sizzling summers and frosty winters. The Wadi Rum desert is also famous for its dramatic scenery from sky-high red sand dunes to epic canyons and vast open plains. Not surprisingly, the deep-red alien landscape has become legendary in the movie business. 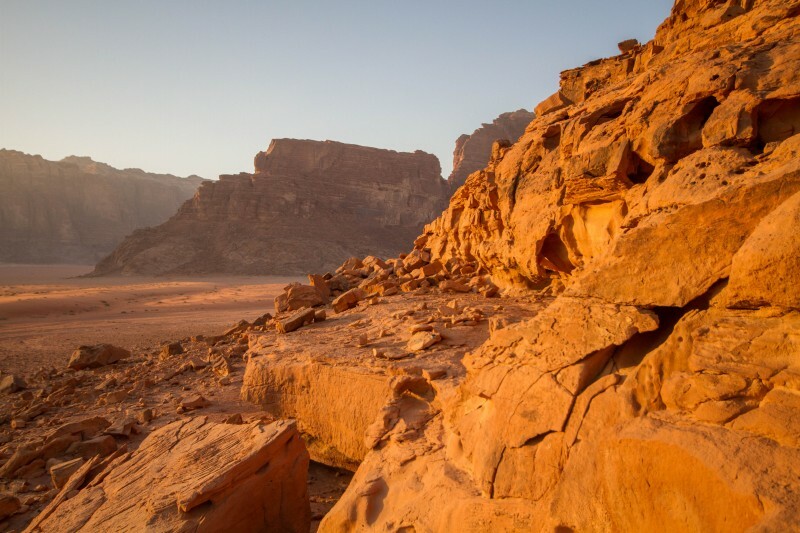 There have been a number of high-profile movies filmed in Wadi Rum including The Martian and Rogue One: A Star Wars Story. The beautiful but desolate landscape of Wadi Rum has helped define the lives of many cultures. There is evidence of life in the region dating back from the Nabataean times. In fact, there are still areas where you can see stone pictographs from these cultures on the walls of the stunning rocks throughout Wadi Rum. A rock in Wadi Rum Jordan with ancient Nabatean inscriptions on it. The Zalabia Bedouin people have made a life out of the barren landscape of Wadi Rum for centuries. 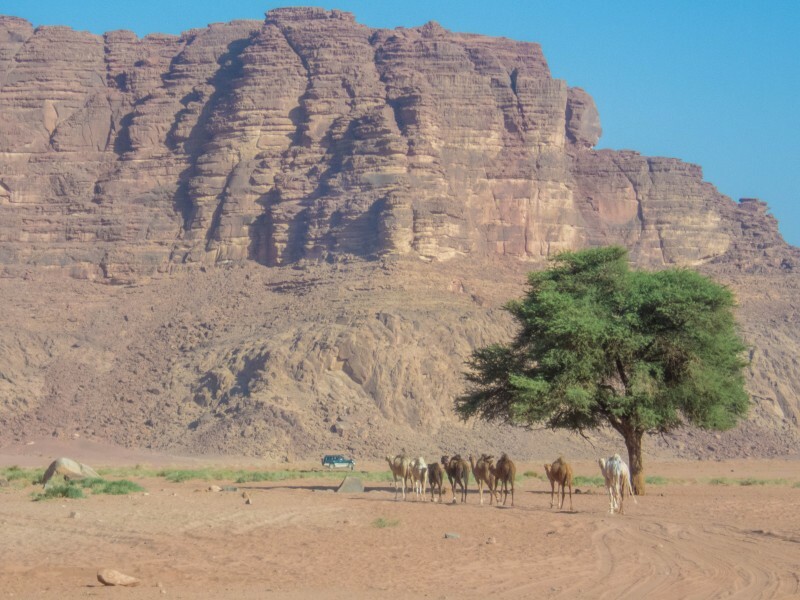 And while traditional Bedouin life in the region was focused on animal herding, The locals have developed Wadi Rum into one of the most important tourist attractions in Jordan. Many travelers make the trip here to experience some of the popular Wadi Rum day tours. They are often visiting as a day trip from Aqaba or Petra. However, for those looking for a rest for the mind and soul, a night or more in a popular overnight Bedouin desert camp offers a medicine that can scarcely be found elsewhere. The local Zalabia Bedouin run most of the tours within Wadi Rum. They built an industry focused around climbers and trekkers. And that industry has grown into one of the largest eco-adventure tourism regions in the country. 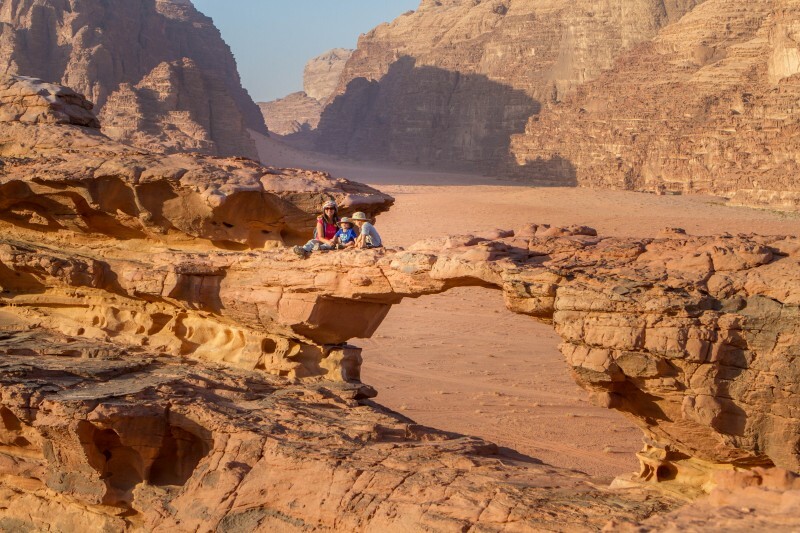 Activities such as camel rides, hiking, and rock-climbing are legendary in Wadi Rum. And with the stunning rock formations that fill Wadi Rum, it’s no surprise why. The setting sun seemed to set the Wadi Rum desert ablaze in a fiery red glow. ATV and Wadi Rum jeep tours are also becoming increasingly popular as a wider range of adventurers discover the region. 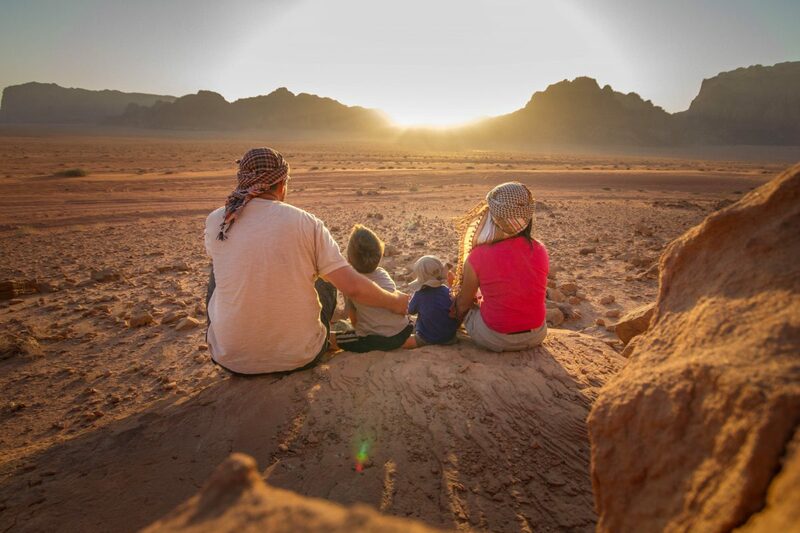 Recently, Bedouin luxury camping retreats have become a huge draw for families and others who travel to Jordan. The mix of adventure, comfort, and great food make these overnight luxury camps popular with those searching for unique experiences in Jordan. We arrived in Wadi Rum after a long drive from Wadi Musa and a morning visiting Little Petra. After picking up our park permits from the Wadi Rum Visitor’s Center, we proceeded through a small series of shops to a restaurant and staging area. This is where we were met by the Wadi Rum jeep driver for our ride through the desert to our Wadi Rum Bedouin Camp for our night under the stars. We piled our small packs into a beat up old Mitsubishi pickup and jumped up into the back. The truck mercifully had a shade to protect us from the intense desert sun. D,, our 1-year-old who had never traveled like this before, was ridiculously excited at the thought of life with no seatbelts. At least, until we hit our first of many bumps on our way to our Wadi Rum luxury camp. These little lumps convinced him that Mommy and Daddy’s lap would be a much safer place to sit. The beat up old Mitsubishi pick up truck was our chariot ride to the Wadi Rum Overnight Luxury Camp. D loved the freedom until we hit the first big bump. That was when he decided it felt much safer in Mommy and Daddy’s arms. Although it was bumpy, the drive to the Wadi Rum luxury camp gave us a spectacular view of the surrounding mountains. We were left in awe of this beautiful environment. The Wadi Rum Bedouin camp came up suddenly as we bounced along the twisty ruts of the Wadi Rum canyons. Nestled at the base of tall desert cliffs the classic green and white luxury tents were just slipping into the shade as the mid-afternoon sun found its way over the mountains. We parked and hopped out to meet with the Wadi Rum Night Luxury Camp manager. We were given a quick tour of the Bedouin camp where we were shown the excellent washroom and shower facilities, the lobby, which offered a bit of air conditioning as a break from the desert heat, the restaurant and finally our own tent. To say we were shocked when we entered the tent was an understatement. The canvas exterior of the Bedouin tents belied their luxurious interior. Inside, these Bedouin camp tents had dramatic overhead drapery, elegant lighting, and impressively comfortable beds that blew our expectations away. 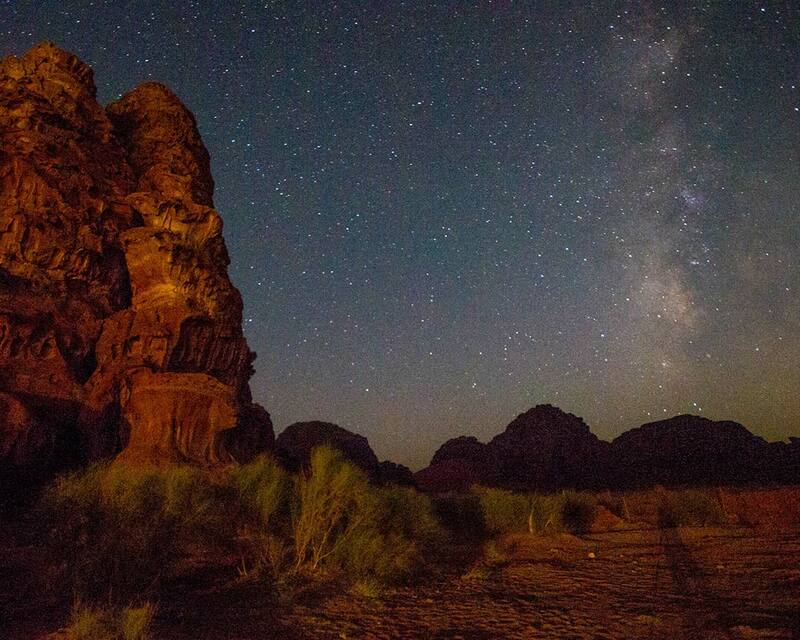 The Wadi Rum Night Luxury Camp itself doesn’t have much to offer visitors during the day. While we could have laid in those ridiculously comfortable beds all day, baking in the desert heat was not our idea of fun. So we opted to join a Wadi Rum Jeep tour of the surrounding area. Our driver arrived in the same beat-up Mitsubishi that brought us to the camp. Then, we were told that he would be bringing us to where the tour begins. Lawrence’s spring is not far from the entrance to Wadi Rum and is marked by a camel and horse watering station. We bounced through the sandy ground towards the Wadi Rum visitors center. Stopping next to a watering hole. Our driver explained in broken English that our guide would be along shortly. In the meantime, there was a spring three-quarters of the way up the mountainside and a large rock with inscriptions on it that we could check out. “Its rushing noise came from my left, by a jutting bastion of cliff over whose crimson face trailed long falling runners of green leaves. The path skirted it in an undercut ledge. On the rock-bulge above were clear-cut Nabatean inscriptions, and a sunk panel incised with a monogram or symbol. Around and about were Arab scratches, including tribe marks, some of which were witnesses of forgotten migrations: but my attention was only for the splashing of water in a crevice under the shadow of the overhanging rock. Once a gushing waterfall, Lawrence’s Spring is now little more than a small pool and a few fig trees. What it does offer is a stunning view of the surrounding desert. Now there is little left of the spring but a small pool and a couple of fig trees. The majority of the water has been diverted to supply the nearby towns and desert communities. C and I were called back by the driver as we attempted the 15-minute climb to the spring. It turns out our guide would be late and he would be driving us to the next location. We piled back into the truck and headed deeper into the valley. We drove until we reached a towering red sand dune. Then, we called down to the driver to stop. C and I looked at each other and both knew we had to climb this sand dune! The four of us head-long at the towering mountain of red sand. D made it about 15 feet up the hill before he decided that he would just rather roll around in the soft dune. So, while Christina joined D in the fun, C and I raced up to the top of the dune. At the peak, we were gifted spectacular views of the surrounding desert. We looked back down the dune from where we came and when C saw the ant-like figures of Christina and D he looked at me with a mischievous smile and cried “Race ya to the bottom!” and off he went running and tumbling down the dune. When we reached the bottom, we saw another cool site. A group of thrill seekers was getting ready to carve through the dunes on sandboards. At the time, this was something I’d never even considered. But I credit this scene with how excited D was to try sandboarding in Huacachina Peru two years later. 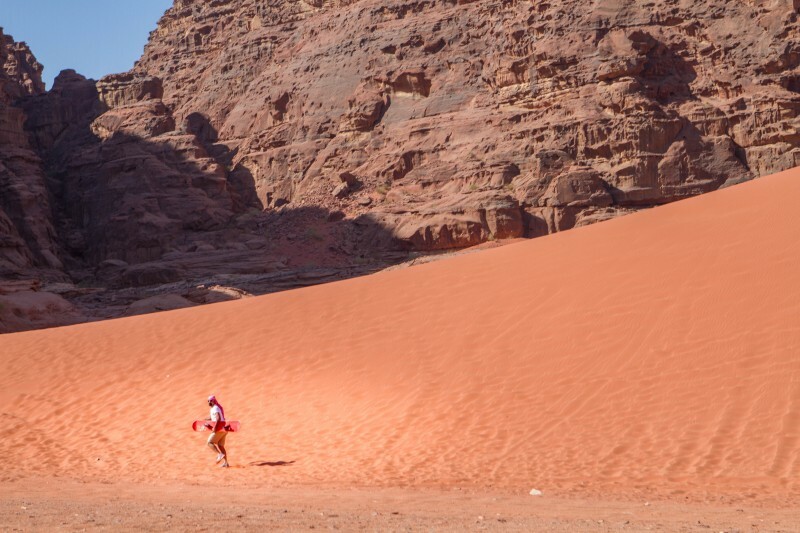 Sandboarding is a popular pastime in Wadi Rum. The towering red dunes offer the perfect place to carve some lines in an unbelievable setting. After our sand dune adventure, we drove a short distance to a small rock arch jutting from the desert floor. It was an easy climb up to the arch and has been known to be scaled in only 39 seconds (For those unfamiliar with this reference, I highly recommend you check out the show Departures on Netflix. It is a huge influence for Christina and I to start our family travel blog). We all made bets as to who would conquer the peak first. With a 2-year-old I wasn’t able to race up to the peak. But D and I did arrive first, gloating impressively as Christina and C crested the peak just behind us. The top, a 4-meter rock arch offers an impressive and unique perch to view the surrounding countryside. We enjoyed our time there before moving on to catch the desert sunset. Christina and the boys pose for a picture on a rock arch in the Wadi Rum desert. Our driver shouted that we must be quick if we wanted to catch the sunset. So we jumped into the back of the truck and were whisked off to a place a few minutes away in the middle of the valley. We were surprised at the relative bleakness of the spot compared to the beautiful arch we were just at. Christina and I asked if “this was it?” and the guide pointed towards the sinking sun in the distance and shrugged. Thinking that our original location would have probably been one of the best spots to catch this magnificent view and yet knowing we were running short on time, we instead pointed to a low cliff face a few hundred metres away and the driver agreed to bring us there. We skipped out of the truck and climbed up to a perch above the desert floor to catch the view. The sunset was spectacular! The golden sun lit the desert up in a fiery blaze of red. We snuggled together to witness the setting sun, enjoying a moment of solitude and solemnity where we could think about the incredible sites that we had witnessed and be grateful for a life that has allowed us to experience some of the world’s most wondrous places. This short period of zen was one of the most memorable moments of all of our travels. We returned to the Bedouin camp refreshed, relaxed and very hungry. After cleaning up, we joined the others staying at the Wadi Rum Night Luxury Camp around the roaring fire pit. The camp manager called us over to watch as the chefs prepare the meal. We were excited to learn that our dinner for the night was being cooked in a traditional Bedouin style. The Bedouin food was left to slow-roast in a charcoal-filled pit dug deep into the desert sand. We were called over as the chef was preparing to lift the night’s feast from the ground and everyone clapped excitedly as the delicious meal of chicken and vegetables was pulled from the ground. 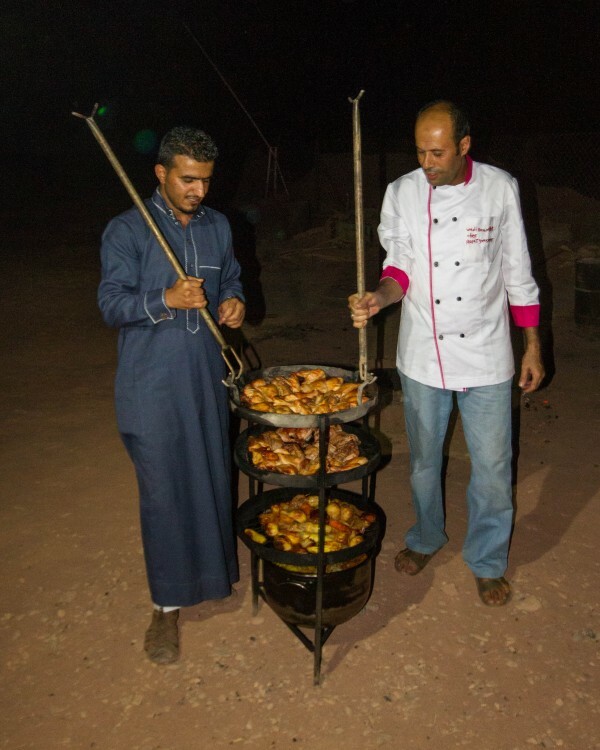 The delicious meal of chicken and vegetables was cooked in the traditional manner at the Wadi Rum Night Luxury Camp. It is laid in a deep charcoal filled pit dug within the desert floor and left for a few hours. The food was absolutely mouthwatering. And we all ate our fill, and then some. As we finished, it became obvious that the boys had hit their limit for the day and were barely keeping their heads off of their dinner plates. So we proceeded to settle the boys into their beds, sang them a song and returned to the campfire for some mint tea and conversation. The night cooled to a perfect temperature as we all laid under the vast canopy of stars, a view that living in the city can make you forget even exists. Only the children being alone in the tent stopped us from simply drifting off under the stars rather than returning to our tent. Which Bedouin Camp in the Wadi Rum Desert Should You Stay At? 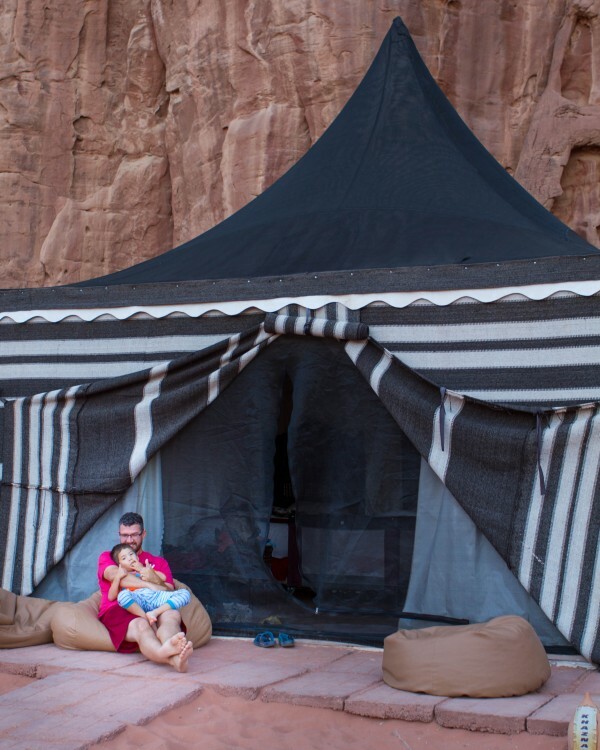 With their increasing popularity, the options for staying in a Bedouin Camp in the Wadi Rum Desert have been growing. While most have glowing reviews, here are a few of our favorites. Our night in the Wadi Rum Bedouin camp was spent at the Wadi Rum Night Luxury Camp. And for a tent in the middle of the desert, they lived up to their name. The beds were among the most comfortable we had ever slept on. Although the endless stars had me begging to sleep outside near the cozy fire. 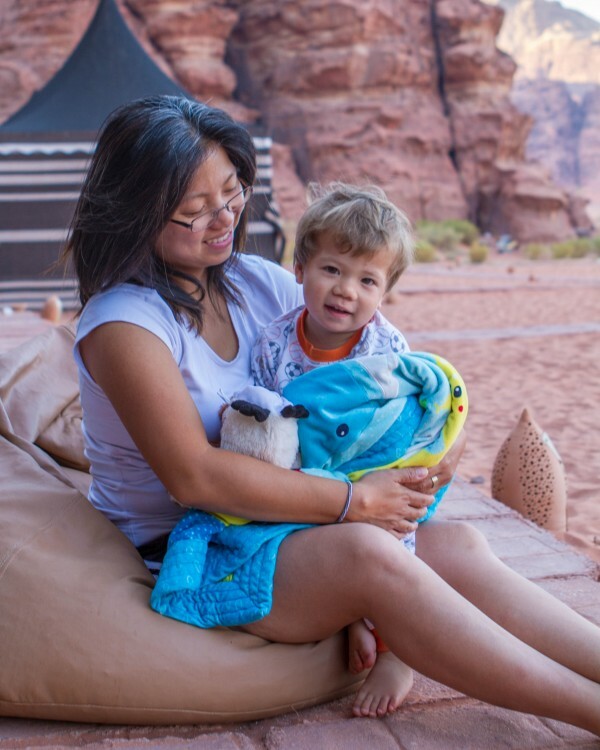 We were treated to water, drinks, and delicious Bedouin meals during our visit and we highly recommend it for families, or couples looking for a relaxing, accessible place to experience the majesty of Wadi Rum. 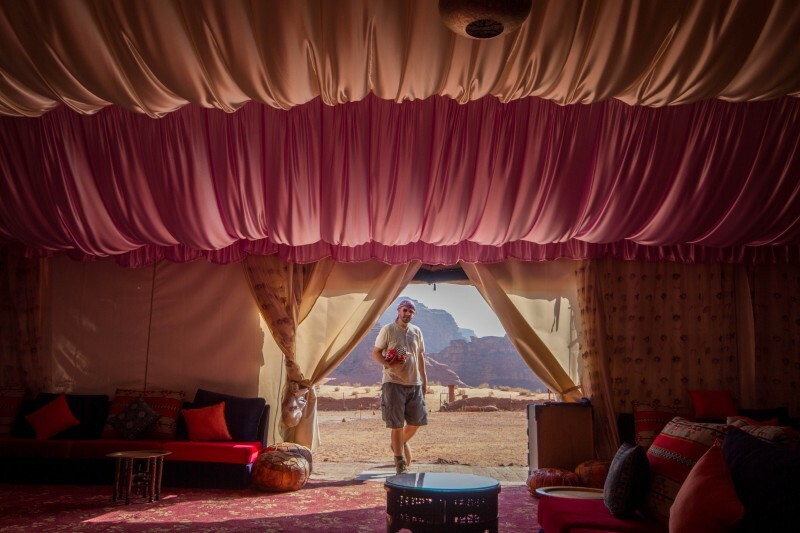 You can check out the prices and availability of the Wadi Rum Night Luxury Camp here. Considered to be excellent value, especially for family travelers, the Salman Zwaidh Camp offers both private and shared tents. For families, tent options include up to 6 single beds. At night, traditional Bedouin song and stories are shared near the campfire. You can check out the prices and availability of the Salman Zwaidh Camp here. Salem camp offers a more modest accommodation style. And depending on your style, this might suit you just fine. If I was to return to Wadi Rum during the late summer, I would definitely choose to sleep outside by the fire, so the less luxurious sleeping accommodations would be fine. But during the colder winter months, something a bit cozier might be preferred by those traveling with children. You can check out the prices and availability of the Salem Camp in Wadi Rum here. We woke up to the peaceful light of the desert morning. Breakfast at the camp was served late, and with no place to be, we swapped family cuddles in the bean bag chairs outside of our tent and watched the sun slowly rise and cut down the mountain shadows. We enjoyed a delicious breakfast before wishing our hosts a fond farewell and packing into the now familiar Mitsubishi for our last ride through the desert. Being a Wandering Wagars family adventure, we couldn’t simply drive back to the van. Instead, we stopped about halfway from the camp where we met a local who would guide us on mounted camels back to the village entrance. C was ecstatic! Every day on our Jordan journey he asked “when can we ride a camel?”, and now would be his big chance! We mounted up and images of Lawrence of Arabia swished through our minds as we rode peacefully through the desert valley towards civilization. We were on our way to Aqaba where Christina and I would venture under the waters of the Red Sea. Have you ever traveled to Wadi Rum, Jordan? Or stayed at a Bedouin camp? Tell us all about it in the comments below. Or feel free to contact us and tell us your story! You can find the best prices and availability for the Wadi Rum Night Luxury Camp one Booking.com, or click the link below. Looks like a fun and epic adventure! I’m lovin’ the milky way shots, amazing! How much did the Jeep tour cost if you don’t mind me asking? Hello Adonis, so glad you like the shots! 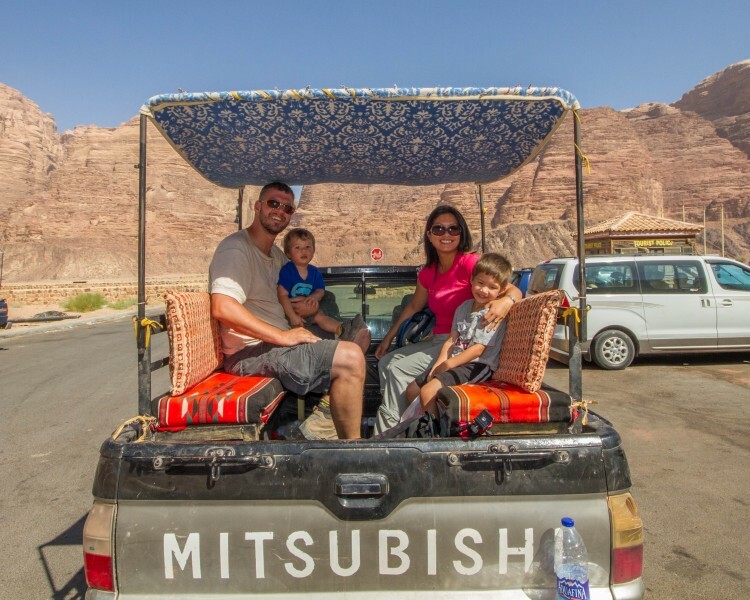 Our jeep tour was packaged with our package with the Wadi Rum Night Luxury camp, however I believe unpackaged tours start around $75 US and go up based on length and distance. 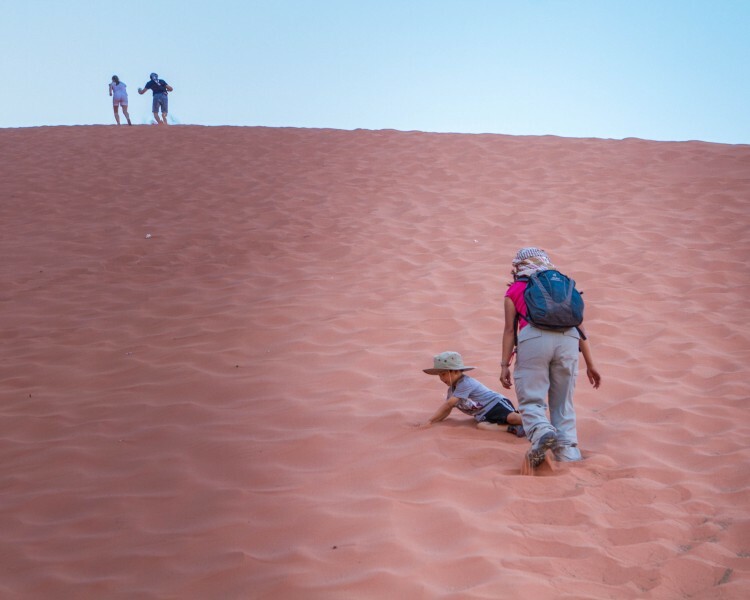 What a nice ride through the desert you guys are doing…and with kids, too! A real adventure! Love that you got to see so much and experience the different sights by day and by night. Sunset looks beautiful with the colors on already a pretty background. Looks like a great time. I went to Wadi Rum and Petra many years ago and it still ranks up there as one of the best experiences of my life. I would go back there in a heartbeat! We feel the same! Thanks for stopping by. Wow, those pictures of the stars are stunning. What a place. I remember watching Lawrence of Arabia as a kid and being mesmerized by the sand dunes and landscapes. Would love to see it in person and experience the life of the nomads for a few days. It also looks like a great adventure for the whole family. 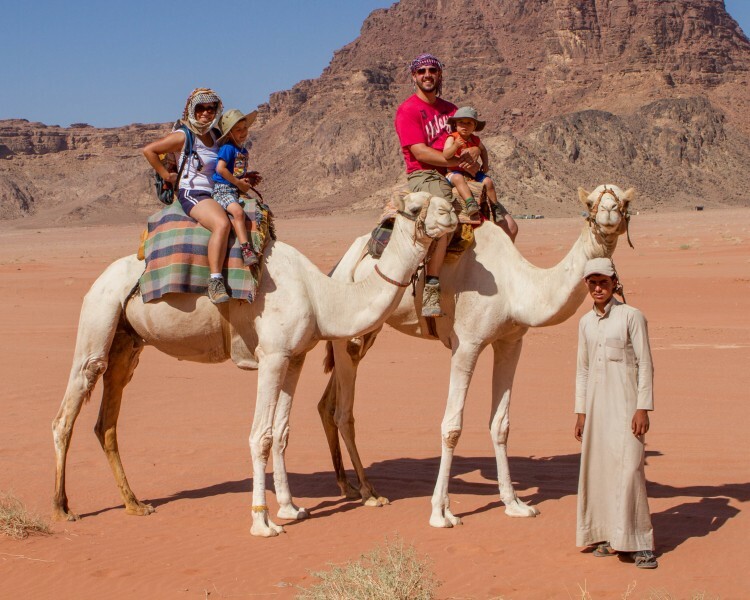 Your kiddos look like they are having a blast, especially with the camels. Love the post and love what you’re doing exposing your boys to the amazing world of travel! Jordan is at the top of my bucket list and your amazing photos are making me want to go now! I think our boys would love it. Thanks for the inspiration! So happy to hear you say that Jennifer! It’s a great place for kids! We really loved Wadi Rum as well. I do think it’s a perfect place for kids. We went in winter and didn’t stay the night, but your star photo is stunning…so maybe I’ll have to go back or spend the night in another desert somewhere else! I want to be in those beautiful beds, although I may not be able to pull myself away from the stars…. What a fascinating adventure, and of course I would expect nothing less from your awesome family! Love that C got to ride his camel and that family picture of you all on the camels is something to cherish forever. What a gorgeous photo. 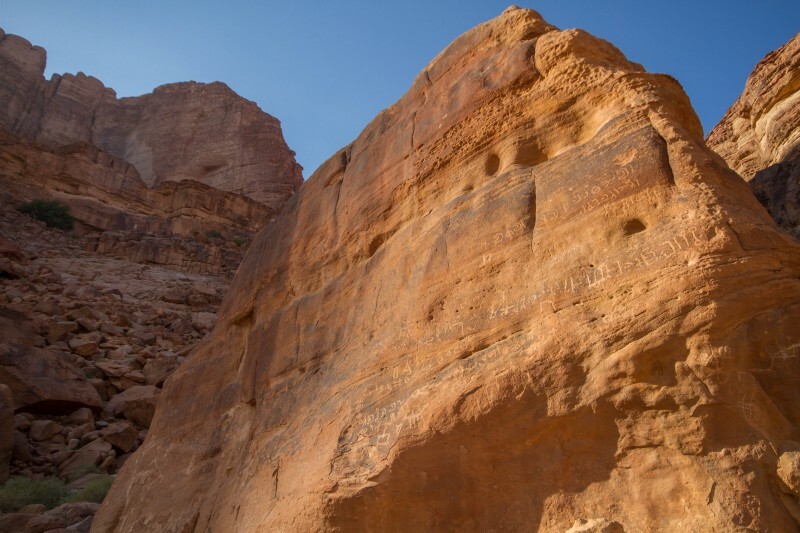 The sites in Jordan are spectacular and I, like yourself, was pleasantly surprised by your digs…how nice! You certainly made the most of your days and the quote from TE Lawrence was a great addition. This looks like SO much fun and I’m loving the photos! I’ve been dying to go to Jordan and this just makes me want to go even more! What a great adventure especially for the kids ! It’s really awesome they can see the World so early. This post brings back so many great memories. We absolutely loved our Wadi Rum experience! Looks like you guys had the luxury experience, our tents was nothing like that but we loved it though. We’re dreaming of going back because we really want to see more of Wadi Rum, and last time Jon suffered with pain because of kidney stones, so I was the one who climbed the natural bridges everywhere. Would love to climb them all together someday. Seeing your pictures feels like a trip back in time Kevin! The stone pictographs sound fascinating, as does the entire experience. Jordan offers so much as a nation; definitely look forward to a visit. Thanks for sharing.